Hyde Park, NY – Among the almost 50,000 graduates of The Culinary Institute of America are standouts in every segment of the food world. This, of course, includes many names everyone knows from popular television cooking shows. 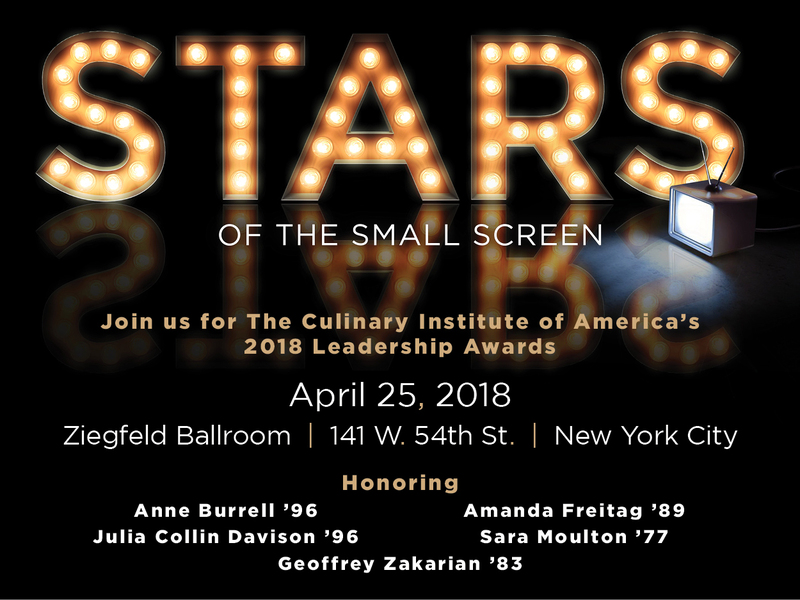 At the CIA’s Augie Award™ ceremony on April 25, hundreds of foodservice and hospitality industry leaders, celebrity chefs, alumni, and other luminaries from business and entertainment will come together at the Ziegfeld Ballroom in New York City to honor five CIA graduates who are “Stars of the Small Screen.” The Augies—the college’s Leadership Awards event—is the CIA’s largest annual fundraising program. Anne Burrell made her name in the restaurant scene of New York City at places like Felidia, the Savoy, and Centro Vinoteca. She recently opened Phil and Anne’s Good Time Lounge in Brooklyn, NY. She has hosted Food Network’s Secrets of a Restaurant Chef, Chef Wanted, and Worst Cooks in America. Julia Collin Davison has made it her life’s work to bring accessible and flavorful recipes to the home cook. Over the past 16 years, she’s been test cook, editor of the book division, and on-air cook/presenter at Cook’s Illustrated magazine and its affiliated PBS television shows Cook’s Country and America’s Test Kitchen. She is now co-host of the two television programs. Amanda Freitag worked for Jean-Georges Vongerichten at Vong after graduating from the CIA. From there, she was chef de cuisine at Verbena and executive chef at The Harrison. While competing on the Food Network’s Iron Chef America, her personality and skills came shining through and the network invited her to become a judge on its immensely popular Chopped. Sara Moulton has helped generations of home cooks get tasty dinners on the table every night through her shows on the Food Network and PBS: Cooking Live, Sara’s Secrets, and Sara’s Weeknight Meals. Chef Moulton has penned four cookbooks, including Home Cooking 101. She also co-founded the New York Women’s Culinary Alliance. Geoffrey Zakarian has made his mark as a successful chef, restaurateur, cookbook author, and on-air personality. He has the distinction of being an Iron Chef and host of the Food Network’s Chopped, The Kitchen, and Cooks vs. Cons. In addition, he serves as chairman of the Food Council for City Harvest. Information about tickets and sponsorship opportunities, along with more details about the event are available online.